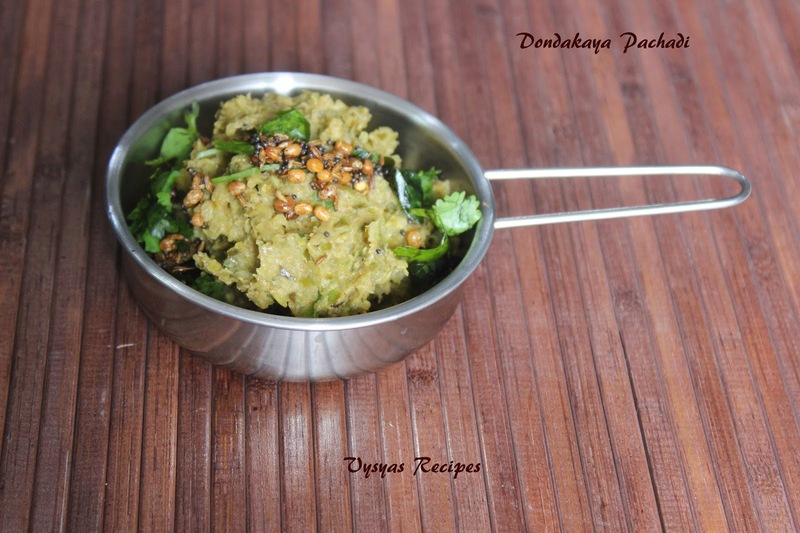 Dondakaya pachadi goes well with hot rice, with a dollop of Ghee. Ivyguord is rich in Vitamin C, which helps in strengthening your bones and improving your body structure. It also has plenty of Vitamin B1 and B2, as also trace quantities of Vitamin A. All these vitamins are vital for the human body, and help in strengthening your immune system, and thus keep away diseases.Ivy gourd is said to be a brilliant bloody purifier and detoxifier, which thus helps in cleansing your body. It also simulates the liver, and clears harmful germs from your body. Chop the ivyguord into roundels and keep it aside. Heat the oil, add green chillies and saute till it turns pale and remove from kadai. In the same kadai, add ivyGuord, saute for 2 minutes in a high flame, then cook it covered, till is soft. Saute now and then. Grind tamarind cooked ivyguord(dondakaya),green chillies and salt together by sprinkling little water to a coarse paste.Heat the kadai, add mustard seeds,when it splutters add cumin seeds, when it sizzles, add urad dal and curry leaves, when dal turns golden brown add this tempering over Thovaiyal. Now Dondakaya pachady is ready. It serves very well with idli,dosa and rice.